On Friday, Governor Reynolds travelled to Mason City as part of her “Building A Better Iowa” tour. Reynolds shattered another glass ceiling last week when she became the first woman to govern the Hawkeye State. Republicans have been trendsetters for women leaders in Iowa. Senator Joni Ernst is the first woman to represent Iowa as a federal office holder. Speaker Linda Upmeyer is the top ranking legislator in the lower chamber at the State Capitol. State Auditor Mary Mosiman is the first woman to hold the office. Iowa Democrats aren’t too pleased about watching the Republicans shatter the glass ceiling. However if you paid attention to the online comments that accompany stories about female leaders it’s no surprise they aren’t successful. Identity politics have become a central part of the Democratic strategy. 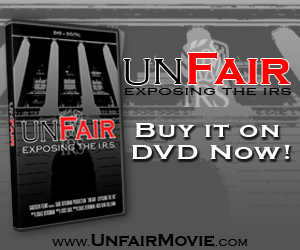 They try to win over populations of people by getting them to accept that they are victims and then accept that the only answer to their victimization is to become dependent on government programs. While Republicans actually promote and advance women leaders it seems that Democrats are the ones victimizing women with crass sexism. 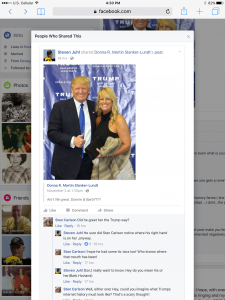 Last week Cerro Gordo GOP chair, Barbara Hovland, wrote an editorial in support of an investigation into Trump’s ties with Russia. The commentary it generated by liberals had little to do with the piece and instead joked about Hovland being raped. 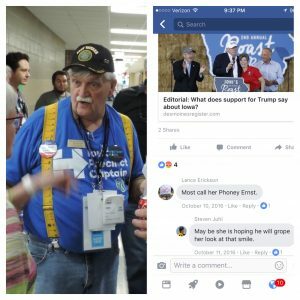 Although the commenters posted on the article anonymously the commentary mirrors similar posts made during Hovland’s run for state house. 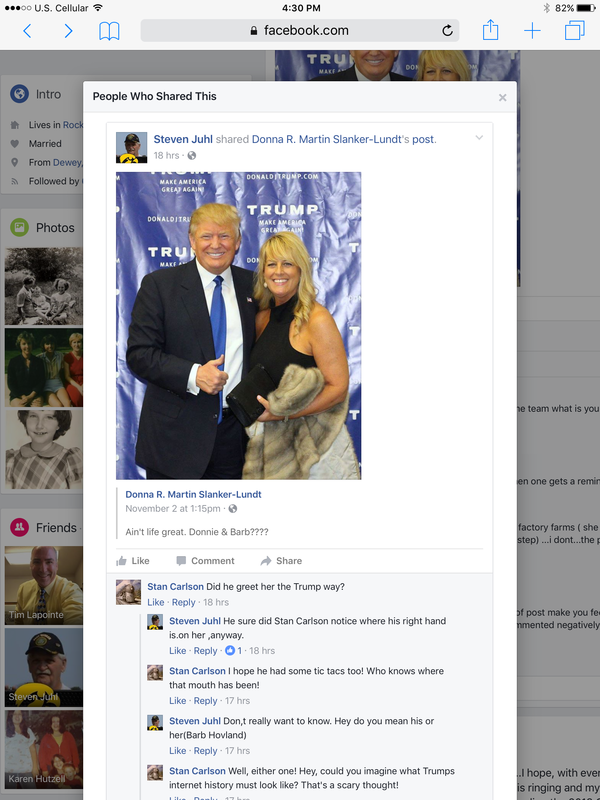 Local Hillary Clinton Precinct Captain, Steven Juhl, made strikingly close statements on a photo of Hovland with Trump. He echoed the same thing about Senator Joni Ernst. Hovland challenged Sharon Steckman for State House. 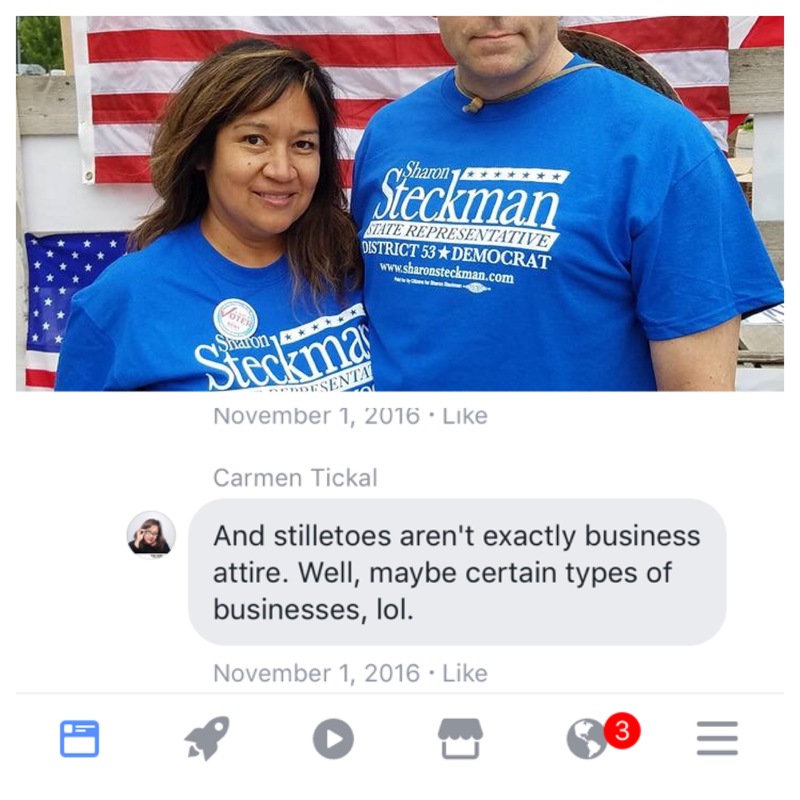 Steckman’s close friend, Carmen Tickal, regularly made comments implying Hovland was a prostitute. The irony is lost on Democrats who claim that Hillary Clinton lost the race because of sexism. Perhaps they are correct to assume it did play a role. Republicans regularly nominate female candidates who gain support from independents and are elected to high offices. The obvious sexism among Democrats may be holding them back. The impact of this kind of chauvinistic abuse is lost on these folks who have no empathy for the fact that a woman running for office is somebody’s mother, daughter, wife or sister. They viciously attack because they tell themselves they have the higher moral ground like a racist who denies he is an oppressor because he has a black friend. 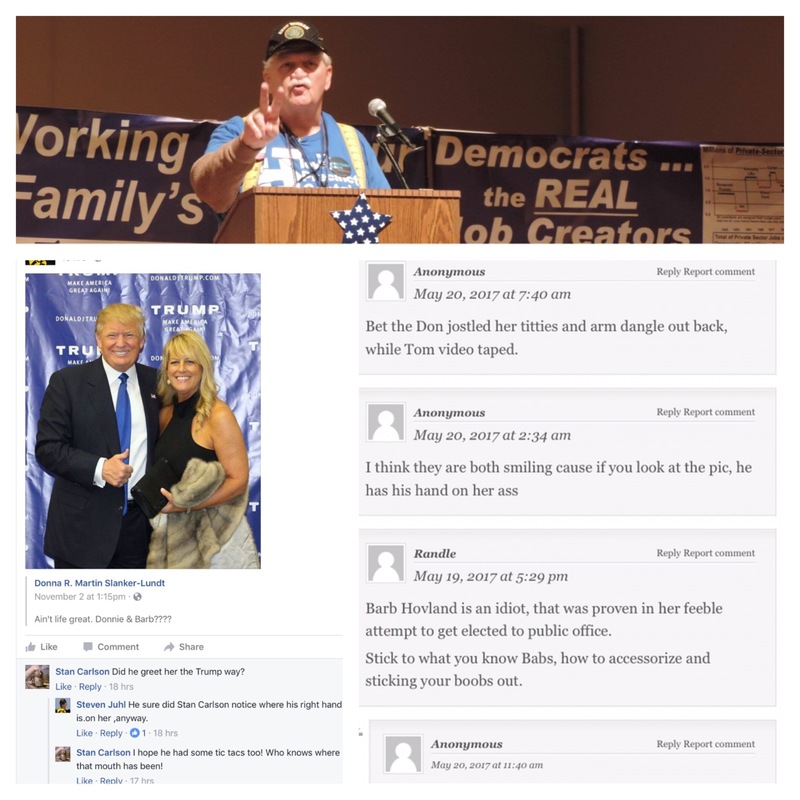 Mean spirited, ad hominem attacks make candidate recruitment difficult. Many great leaders pass on public office because of a desire to keep their family out of the rancor and scrutiny of public attention. The sexism among Democrats is hurting our state. 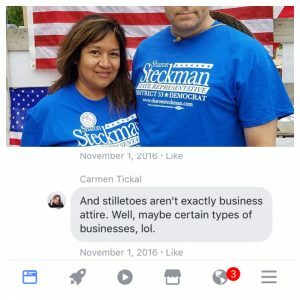 “I am exposing the sunlight on the vile and vicious attacks on social media that I endured for the last year as a candidate for District 53 Iowa State Representative. 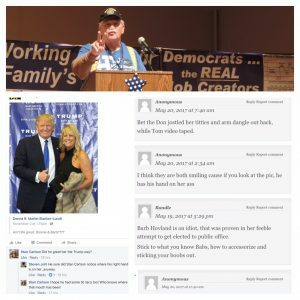 In my bid for trying to make a difference for my hometown (I was born and raised all my life in Mason City) and my beloved state, I never imagined the bullying and the sexual and violating attacks from the left. “It is with much thought and courage for me to bring this to light. I have a 24 year old daughter. I want her to know that this type of behavior should not be tolerated. Just because you run for public office, you should not have to be attacked like I was on social media. I’m all for free speech, but when people are allowed to post ‘anonymous’ libel and make sexual, vile attacks to people, without consequences, we have a problem! John Thompson of Jefferson is a graduate of West Point and Harvard and member of the Republican Party of Iowa State Central Committee.